One of the regulars at our Sweat Lodge ceremonies is a friend of mine. He lost his right arm in a car crash when he was a young man. Now he’s a grandfather in his 50s who has lived over 30 years with only his left arm. As we beat our drums and sang the native songs in the pitch black lodge, he dropped his beater. I sensed him urgently trying to find it as the song continued without the pounding of his drum. And then… suddenly, his drumbeats returned. Long after the ceremony ended, I kept thinking about life with one arm. My friend is out of Balance. He must make adjustments for everyday activities we do without thinking, like tying shoes, eating, typing on the computer. For me, Balance requires considering the four quadrants of the Wheel. On the horizontal axis we have the mind in the East (Right Action) and the body in the West (Higher Purpose). On the other axis, we have Spirit in the North (Integrity) and Heart in the South (Trust). Considering all four quadrants of the Wisdom Wheel helps me Journey through life, embracing challenges and issues honoring not just my Self but also others. I have so much respect for my friend with one arm. Whenever we send time together, he shows me no matter the challenges we face, they can be surmounted. It’s the Shadow time of year on the Wisdom Wheel calendar as our Leo friends celebrate their birthdays. One of the most famous living Leos is President Barack Obama who will turn 55 on August 4. Currently, he is living at the center of the Wheel of Life, under the Law of Balance as we all do, from ages 0-2, 27-29, 54-56, and 81-83. Couldn’t we all benefit from more Balance right now? Do whatever you need to to get yours back, especially if you feel manipulated by those who exploit divide and conquer tactics during these Democratic and Republican conventions. It’s a relief to know the Balance Law is nudging the Commander in Chief at the moment but each of must work to help hold the center. On social media, I’ve actively resisted being pushed into opposing camps. For the sake of Balance, I am seeking out and welcoming differing viewpoints. Otherwise, we end up in an echo chamber, only hearing what we like, and ignoring the reality of the rest. Neither Republicans nor Democrats have spoken enough about how to heal the riffs between their parties. Their conventions have further polarized voters. And no one can talk about improving things for the middle class in the US or other countries, without talking about enlarging the middle ground at the center. Have you heard about how either party is going to level the playing field so 85% of the additional wealth being created in the US is going to be shared across the board in the future instead of going into the pockets of the 1%, like it has lately? Tax reform alone will not restore us to Balance, which is another word for fairness, justice and equality. Hatred, acrimony and violence come from those who feel marginalized and excluded. How can we bring them back into the Process? If we abandon the center, and fail to build consensus and restore Balance, others will continue to employ the Shadow side of prejudice, ignorance and fear to take advantage of those who already feel vulnerable and in need of a savior. Recognize the tactics and resist being pushed into warring camps. Polarization keeps us off Balance and unable to unify. This weakens everyone. Don’t fail to see how crucial the middle ground is. Who’s scared of socialism? Who’s scared of capitalism? Some recent surveys actually show that many young people are disillusioned by capitalism. Capitalism thrives on competition. Unfortunately, when those at the top have the lion’s share, our so-called free market feels out of Balance. Is the Higher Purpose of America’s socioeconomic model to concentrate wealth in the hands of the few? And if so, what are the Causes & Effects? Where is the Integrity in this Process? Do we Trust our elected officials? When I look at American sports culture, I realize it embodies socialist approaches. For instance, the NFL draft is now taking players for next season. Draft systems understand the problems of Power in the hands of the few and the perils of imbalance. Therefore, the worst teams select the best players first. This Process is an Enlightened method to re-Balance teams. Ultimately, though, the NFL operates on the same level as capitalism: competition. If we had a draft system in life, though, what might it look like? Inevitably, we’d have fallow periods, where we feel our best is behind us. But in Right Relationship with our partners and friends, we can draft what we need to bring out our best. The Wisdom Wheel can also help us draft what we need to gain Balance and enable us to make wiser Choices when we interact with others. My wife is at a women’s memoir writing conference in Austin, Texas. She’s in her element, this is Right Relationship in action, or more accurately, “Write Relationship”. Meanwhile, solo in Rhode Island, I shared a poem entitled “Ski Jumping” at a poetry reading. To me, “Ski Jumping” is a metaphor for taking the plunge and/or doing something out of the ordinary. When I let go, I travel into the unknown, I hurtle down the slope into the air, toward an uncertain future and I hope to land well. As I navigate life’s ski jumps, it’s good to have the Wisdom Wheel as my companion. I check in with it. Am I in Balance? Is this Process likely to yield a good outcome? What are the Cause & Effect considerations I need to think about? If I plan well and remain present I’m confident that my Faith will be rewarded and I will “land well”, so to speak. Working with the Wisdom Wheel as my guide these past 15 years has helped me evolve into a more well-rounded person. I have embraced and integrated the so-called right and left hemispheres of my mind. I wonder what my brain would look like under analysis of a MRI? Would it reflect the Balance I feel? then arms aloft in triumph. How do you begin such a journey? ready to fly, see the sky. alone, down the slope, jumping. I lost my keys last week. It was a powerful reminder to me that my Balance was off. Without my keys, I couldn’t access my own house or car. Also missing were my IDs, customer loyalty tags, library card, gym membership, grocery loyalty tags and more. I dreaded the thought of replacing them. I racked my brain, I retraced my steps, I even suspected someone of pilfering them from my purse! My husband says these things tend to happen during transitions. The risk of falling is greater when we go from one place to another. This is also true psychologically, when we go from one state of mind to another (like shifting from thinking to doing). To re-center myself, I sat down next to the stones of the Wisdom Wheel. I invited my intuition to raise Awareness over what’s affecting my Balance. Then it dawned on me that most of the media I consume, from Facebook to the nightly news, provokes severe anxiety. Election coverage is enough to knock me off Balance and the mere prospect of a Trump presidency makes me nauseous and dizzy. These sensations of imbalance were followed by the image of a gyroscope, a three-dimensional version of the Wheel. Mechanical gyroscopes have been used for orientation purposes since Leon Foucault demonstrated the spinning and turning of our Earth with one in 1852. Gyroscopes are composed of 4 main parts, much like the Wisdom Wheel. In the middle, there’s a vertical axis bar that pierces the center of a flat disk called a rotor. Attached to these are two metal rims, representing North/South and East/West directions, and surrounding all this is an outer frame, which allows the inner mechanism to roll around freely, continuously rotating and realigning. What a great metaphor for the Process of reBalancing! This is exactly what we need in our modern lives: a constant, dynamic re-positioning and reorientation to Ultimate Reality to help us adjust to the inevitable ups and downs. On a visual level, gyroscopes remind me how Balance is regained: through Right Relationship to motion, momentum and direction on the Great Wheel of Life. As our world undergoes this intense transition Process, many of us lose our Balance without a healthy way to regain it. We react emotionally. Some of us ‘unfriend’ people on Facebook, while others shout at political rallies, and still others take up guns with ISIS. I remembered my keys again and what they symbolize. Access. Door openers, the ability to cross thresholds, to depart and arrive safely. I went back to the supermarket, the last place I had seen them, and sure enough, someone had turned them in. If only it were as simple to locate the keys for restoring Balance in the world at large. Last night, the yoga instructor invited us to set an intention for our practice. Usually, the Law I’m carrying comes to mind first. This month, it’s Balance. I thought of “deepening Balance” as my intention. To me, this means being less frazzled by what goes on around me. Earlier that day, my husband and I had an argument in the car. He was taking me to a new Indian restaurant and relied on his phone’s GPS to guide him. When he turned to take the wrong exit, I mentioned it was the next one. Then he made another wrong turn at a roundabout and still another. My anxiety rose. I realized I was gripping the armrest, uneasy, as though we might have an accident. Two of us were in the car, I wanted to be useful. Do I shut up and do nothing or speak up? Balance. How do we hold onto it when we are fearful? My husband will turn 67 next month. His reflexes are slower than they once were. When I offered to help navigate, he only became angrier. “You talk a lot about teamwork,” I reminded him, though he was in no mood to have me on his team in that moment. Why not? No one wants to be appear less than competent, especially in front of a spouse whose opinion counts for a lot. My husband claimed my presence made it difficult for him to concentrate. So I tried to remain calm while he struggled to work things out. I thought of other women dealing with irascible husbands and trying to keep the peace. For the sake of harmony, we often keep our opinions to ourselves and then suffer when men insist on leading even when they’re wrong. How can we achieve Balance when half of us are not allowed our input? Eventually, we reached the restaurant and ate our curry. But even now, I can’t stop thinking about how this ties into the world at a macro-level. Wars, refugees, climate change, economic disparity. All these problems require a re-Balancing. So far, my personal micro-level need for Balance has been heightened, not deepened. I have been experiencing just the slightest dizziness. I’m not even sure I could call it that. My perception of the world around me seems off kilter, as opposed to a spinning or tipping feeling. Is this a sign of a life in need of Balance? Every time I sit on the ground and lay out my stones I am balancing and re-calibrating. To begin the act of laying out the stones, a level of balance must be achieved. It must be quiet, I must be uninterrupted, I cannot attend to the needs of anyone else (my scale usually tips in favor of meeting the needs of others). Perhaps Giving & Receiving is the law most vividly representing the seesaw of Balance in my life. Looking at and listening to the word “seesaw” I find some juxtaposing concepts between past and present, which also require balancing. The seesaw is a strange thing. It generally requires the assistance of a grownup for two children to begin. What a delight though, when the motion begins! How satisfying when the two sides are balanced so well that each child hovers in the air at the same level. How funny when one’s bottom is so firmly on the ground, clumsy bounces unable to generate the upward momentum. Come to think of it, the playground is full of metaphors for life. I’m sure a Law could apply to each feature. What would the merry-go-round be, other than a wheel itself? I see the Balance of physics all over the playground, primarily because children love shaking up Balance, tipping the scale, playing with Cause & Effect. Sometimes it’s beneficial to throw things out of balance. Revving up or tranquilizing water molecules can disrupt balance into a changed state for cooking, adding moisture to a dry room, creating ice, and so on. Yet Balance flows through nature’s water Cycle giving each molecule its chance to experience each state. I’m sure this applies to humans as well. I went to Catholic Church only for a few years as a child, but I often hear in my mind “Christ has died, Christ has risen, Christ will come again”. I don’t even remember what proceeds or follows it during mass, but I believe in the truth of that statement when removed from its context. When I was a kid, getting grounded was punishment. My parents would forbid me to go outside or see my friends, in order to teach me a lesson over something I’d done wrong. However, as I’ve aged, “getting grounded” has taken on new meaning. Now I envision being rooted, possessing a true foundation and with it, a feeling of security, no matter what life throws at me. Working with the Wisdom Wheel is one way to get grounded so that the changes swirling around don’t knock us over. Incorporating changes requires a robust framework, which the Wisdom Wheel offers. And before we can integrate new things into our world, we need a sense of solidness and substance. This Balance emerges from doing the deep inner work of alignment with All That Is, dare I say: The Universe. There will always be things far greater than our small, fleeting selves. Accepting this is the beginning of wisdom. And then comes the work of orienting ourselves to what is out there! The order in the Universe is a marvel to behold. Knowing that the patterns of the starry constellations mirror the synapses in my tiny brain gives me an odd confidence. I take it as a sign that I do belong in this world. In the 20 years since I began studying the Wisdom Wheel, my capacity to appreciate and “go with the flow” has grown in leaps and bounds. This week as I sat with a new student, I realized again how powerful it is to have a map of the Universe. How did I navigate changes and decision-making before the Wisdom Wheel? 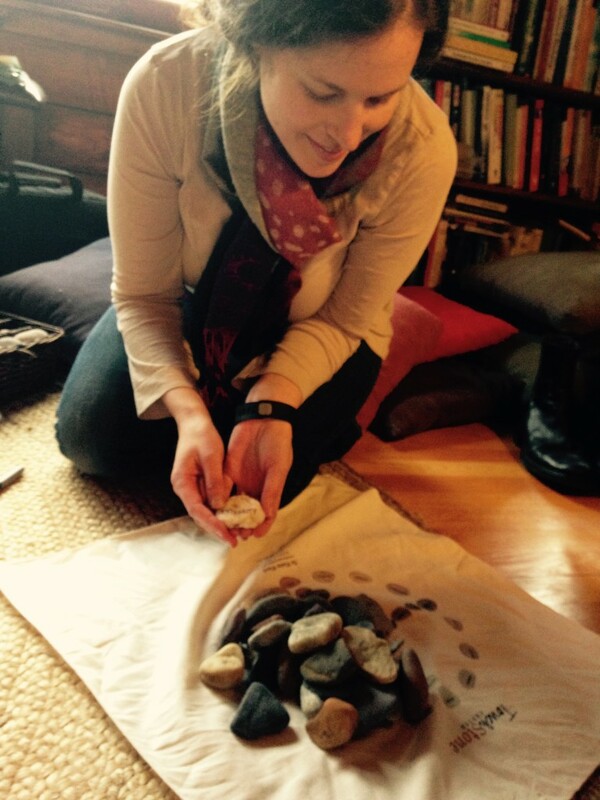 As we laid out the stones she’d collected from the beach, we sensed a groundedness at the level of existence. We organized the 36 stones, starting with the center rock that will always represent Balance. The large yellow stone will be placed in the East, the red one in the South, the black one in the West, the white one in the North. Everytime we sit sit circle and lay out the Wisdom Wheel, we’re recreating the Order in the Universe. Invoking and honoring what we are all part of is the beginning of learning to cooperate with All That Is.